Last Saturday the Town of Wilmington took an important step to recognize the service and sacrifice of PFC Antonio Joseph Gagnon, who was killed in action on July 16, 1950 during the Korean War. 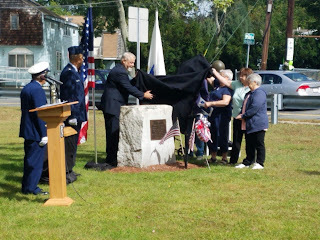 Through the efforts of the town's Veterans Department, a memorial was constructed on the shores of Silver Lake near the neighborhood where PFC Gagnon had live. I was honored to participate in Saturday's dedication of that memorial to a heroic individual, who received the Korean Ambassador for Peace Medal and served in the 19th Infantry Regiment, 24th Infantry Division of the U.S. Army. A special thanks to Wilmington Veterans Service Officer Lou Cimaglia for coordinating the effort to properly recognize PFC Gagnon.